이 책은 30분의 불·보살의 이름을 나열하고 불경 이름을 빌려서 편집한 것으로, 이를 외우면 공덕이 생긴다고 한다. 나무에 새겨서 닥종이에 찍은 것으로, 병풍처럼 펼쳐서 볼 수 있는 형태로 되어 있으며, 크기는 세로 21.7㎝, 가로 8.8㎝이다. 책 끝에 있는 기록에 의하면, 고려 충숙왕 복위 8년(1339)에 조시우와 정공연 등이 시주하여, 남영신이 글을 쓰고, 혜일(慧一)이 새겨서 간행하였음을 알 수 있다. 이 책은 불·보살의 이름을 외울 것을 권장한 신앙 의식용으로, 당시 신앙경향의 한 면을 엿볼 수 있는 자료로 평가된다. Listing 30 names of Bodhisattvas, this book was edited like a sutra. Memorizing the names is said to build up one’s credit in heaven. 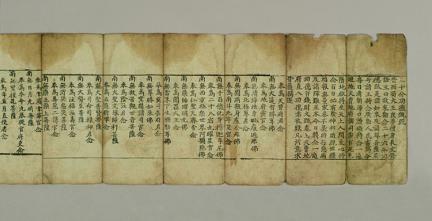 Printed on mulberry paper, this woodblock book can be folded like a folding screen and is 21.7 cm long and 8.8 cm wide. 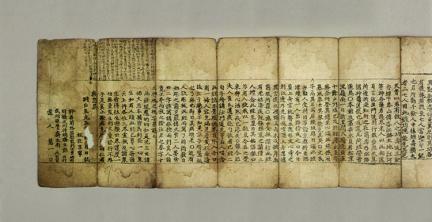 According to a record at the end of this book, it was composed by Nam Yeongsin, carved by Hyeil, and printed through the donation of Jo Si-u and Jeong Gong-yeon in 1339 (eighth year of the reign of King Chungsuk of the Goryeo Dynasty). This book encouraged the repetition of the names of Buddhas and Bodhisattvas, and it was considered a valuable material in studying the typical Buddhism in that period.